I was at the Fantasy Flight Games GAMA panel earlier today when the fifth set of Star Wars: Destiny was announced. After squirming through the rest of the presentation live streaming from my phone, I finally got the chance to dive into their announcement – and oh my, what an announcement! On my first skim through the article, I missed two really critical details. The first is that the set would “focus on the unique equipment, abilities, and tactics of many of the Saga’s most iconic characters”. The second seems even crazier, which is that “the set includes the most expensive support yet, a new way to bring back defeated characters, and a battlefield that comes with its own die.” It is easy to be hyperbolic about new sets, but this is definitely setting a high bar for insanity. Before I get to it, I should mention (as demanded by our marketing team) that we just launched Way of the Force Saga Sets and have a limited quantity available for pre-order that are shipping on release! My initial reaction to the announcement was pure, unfettered excitement! After the Two-Player Game, Balance of the Force list, Rivals, and Legacies, it definitely seemed that community momentum was building. If the online reaction is any sign, Way of the Force seems to have capitalized on that growing sense of enthusiasm (barring the Q3 release, but I digress). More importantly, Way of the Force is building on the foundations that the Two-Player Game and Legacies created, all while showing a better understanding of the underlying system that makes Destiny so fun. As an example, check out the newly announced General Grievous! A quick look at General Grievous makes it obvious that a new understanding exists in terms of character point values. 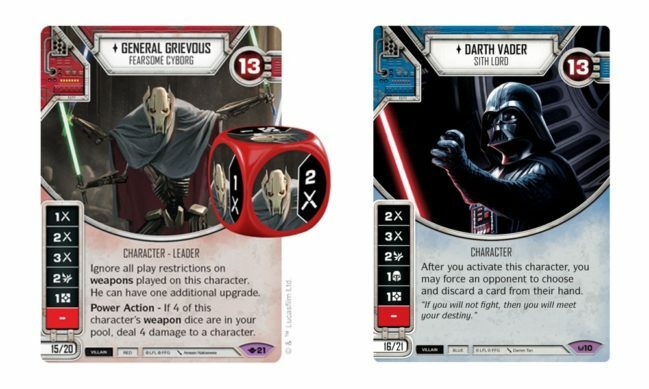 Compared to the original Darth Vader, the new Grievous costs one less point, has a stronger die (generally), and has an ability that allows for the inclusion of the best weapons available. Of course, there is also that Power Action. Power creep is always a concern, so is this Grievous just straight up better than Vader? While I highly value the ability on the Awakenings Vader for discard builds, I find it hard to argue that this Grievous is a better value. This might be frustrating or disappointing if you are a Vader loyalist like me, but the truth is that Awakenings Vader (and a slew of other over-costed early characters) have been slowly disappearing from the meta for some time. I am still crossing my fingers that the Balance of the Force list will bring Vader back into the fold, but in the meantime, this Grievous offers a glimpse of the powerful and thematic designs that we should expect to see for future versions of iconic characters. The next Vader is going to be worth the wait. Speaking of iconic characters… this Luke is GREAT, and not just because he looks amazing. The card is bleeding theme, especially because he can be played elite with Rey from the Two-Player Game. Just think about how this ability really works. Luke is safe from damage-specific control cards, like Crush the Rebellion, but he gives up Hero staples like Guard. At the same time, he fits right in with all of the shield support in Legacies, like Obi-Wan Kenobi’s Lightsaber. That ability, too, is just too thematic, and pushes Luke away from the lightsabers and toward the Force. This Luke will be a consistent and efficient choice for Hero decks, and there are many ways to build him. On the list of characters that deserve to look incredible and be a major part of this game, Luke is near the top – and I am happy to see a version of him that packs the efficiency necessary for tournament play. Now we need to talk about Built to Last. This new plot costs a record high of 4-points and is the first color-specific plot that we have seen. This plot opens up deckbuilding in a way that is supremely interesting, making players consider entirely new archetypes before characters are even chosen. This is the first plot that would ever convince me to take a “less-than-30” team. Padawans bring in a 3-cost unique upgrade for an effective cost of 1, and that is only the beginning of how meaningful this plot could become. The real question is – what other game altering, color-specific plots are in this set? The rest of the cards showcase the development of one of my favorite additions in the Two-Player Game. When I first thumbed through the starter, I was immediately drawn to Rey’s Lightsaber. The idea that cards were not exclusive to certain characters, but better with them, just felt right. 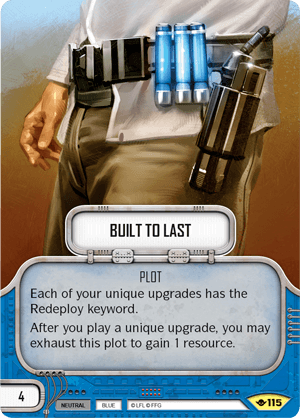 Along with Poe’s Blaster, these cards simultaneously encouraged theme and added an element that allows designers to make more unique and interesting card interactions. For the first time, we have seen events that play with this character-improved mechanic, and this signals that we will see more of these kinds of cards in the future. Might we some day see an R2-D2 character who is better when running Luke or Rey? Or maybe a plot that costs -2 points if played with Darth Vader? Every option is now wide open. If this was not already enough to get amped about, the yellow cards also explore two concepts previously seen. The first is getting the ability to move upgrades from one of your opponent’s characters to another. Remember that when an upgrade is moved, the die associated with it moves back to its card. Paired with the ability to move expensive upgrades to characters that are nearly defeated is going to be quite powerful (if not overly conditional!). Bo-Katan Kryze also has the ability to include Villain upgrades in a hero deck, which is similar to Awakenings Finn – a character often panned as way too expensive for the pleasure. 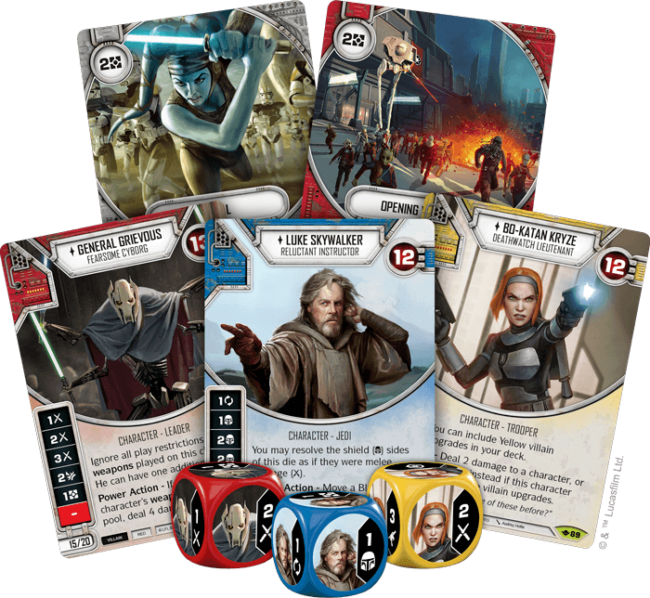 But now with neutral characters like Anakin Skywalker who have abilities that vary based on Hero or Villain cards in your deck, these crossover options become more interesting – as long as the differences between Heroes and Villains do not become overly muddled and indistinct. As it sits, I am currently amped about Way of the Force! 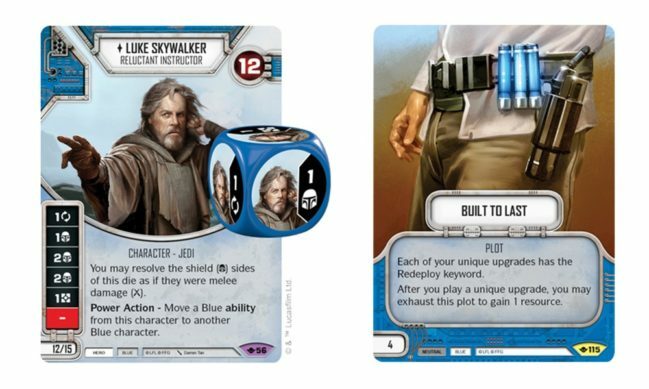 Star Wars: Destiny was already in a healthy place and this announcement is another positive addition to the game, with new options to explore that are not derivative or gimmicky. I love it when designers use the space that they already have available to blast open new aspects of a game. What do you think of what we have seen so far? Let me know in the comments below!